Published April 29, 2013 By Anna T. This post may contain affiliate links. Regardless, I only recommend sites I've researched and/or used and trust. 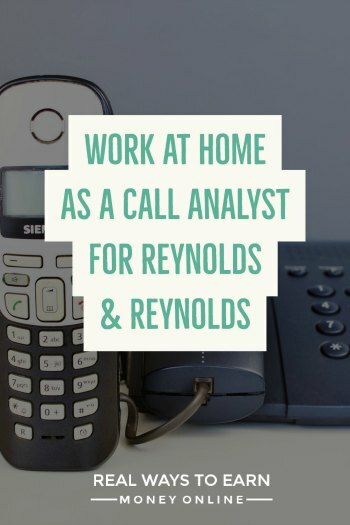 There is a company called Reynolds & Reynolds that occasionally advertises for work from home call analysts. I thought this sounded like a really easy work from home job and in fact reminds me a bit of Humanatic, an extra cash earner where you review recorded phone conversations. I did some research today to find out what I could about it and share with you. The Reynolds & Reynolds company has been in business for over 100 years. They are a “provider of automotive retailing solutions for car dealers and automakers in the U.S., Canada, U.K., and Europe.” Apparently they started off as a printing company and then began servicing only automotive dealerships later on. They are headquartered in Dayton, OH, but they do business worldwide. As a Call Services Remote Representative, you will be responsible for listening to recorded phone conversations between clients and their customers and evaluate these calls based on pre-set criteria for call handling and to identify missed sales opportunities. If you are familiar with Humanatic, then you'll immediately understand why I think this sounds similar. It's basically non-phone because you aren't making calls or taking them, but instead just listening to conversations that have already taken place. The rate of pay for the call analyst job at Reynolds & Reynolds is not posted on the website, but it wasn't too hard to find out what it is. People who have applied say it's in the $7 an hour neighborhood, so it's not a whole lot. I did read that if you stick with it, your pay may go up some to around $8.50. Reynolds & Reynolds pays bi-weekly via direct deposit to your bank account. After sending Reynolds & Reynolds an email expressing your interest in the job, you will get an application to fill out and you'll also have to take some tests. I'm reading that the tests are very, very hard. You are given a personality, math, and aptitude test that people who have applied claim have nothing to do with what the job involves. This seems to be one of the main complaints about this position, next to the low pay. The test is just too hard and most cannot make it past the test to move on the training. If you make it to the training after going through the initial assessment test, you will be paid for it. I'm not clear on how long training lasts though. The fact the training is paid makes me think this might be an employee position rather than something you're doing as an independent contractor. Do you need to live in College Station, TX? The job listing does say College Station, TX, but I'm seeing people online claim that you can live anywhere in the US because everything, including training, is done remotely. It does not appear that you need a phone line, but you do need high-speed internet and unfortunately no Macs are allowed for doing the work. Apparently Reynolds & Reynolds wants you to work 4 p.m. to 7 p.m. Monday through Friday and 7 a.m. to 7 p.m. every other Saturday. That's a long Saturday! I can see how even though it's every other Saturday, that might be a deal breaker for some. Pretty much all the feedback I'm coming across is from people who applied and attempted the tests — and those people are either getting rejection emails that they failed or not hearing back at all. I can't find anything from people who are actually doing this job, although I know they must be out there. Reynolds & Reynolds is a real company and they have been in business for a long time. They also have lots of other jobs available across different categories. You can also check out the reviews at Glassdoor and see what you find. If you wan to apply, go here to see if the job is currently posted on the Reynolds and Reynolds careers page. Get a membership to FlexJobs, a job board I personally pay for and trust with flexible and remote work that is guaranteed to be scam-free. Get 30 percent off a membership with promo code AFFILPROMO. Has anyone heard back or started working with this company?? I sent my resume via email and hope I hear something. 🙂 Any updates from those who applied is greatly appreciated. Reynolds tests are tedious. I couldn’t get a interview based on not passing a silly test. Assessments have nothing to do with the job. I applied for the call analyst job about 4 months ago. They said they had no openings but would keep my resume. I got an email 2 days ago saying they had an opening. I answered some questions (rate is now $9.00/hour) and they sent me the tests yesterday. WOW! Some of them were common sense or vocabulary, but the math was hideous! Before I did them, I emailed back to tell them I am terrible at math and I didn’t think that had anything to do with the job. I only answered what I knew(you get penalized for wrong answers – leave them blank!) and I really thought I did lousy. But, I was accepted and have my phone interview tomorrow. Guess it pays to be honest! I applied awhile ago and just got an email tonight. The pay is $9.00 an hour. Not sure how many hours you have to work. They sent me a questionnaire to fill out and one of the questions is how many hours am I looking to work. I will keep everyone posted on how it goes and what I find out. Thanks for sharing the rate of pay, Elise! Good luck! Hi I just found this opportunity and then found your Review. Well, the test was a piece of cake it was just some questions that get recorded with different senerios. (sp) However, you were right about the hiring! I received and email stating that they will keep my resume on file as a potential until a position becomes available…. So, until then I’m waiting. I’ll keep checking around.. Thank you, Anna, for the thorough research about Reynolds & Reynolds. To answer your question, the reynolds interview process took too long to complete. By the time I got to the third interview stage, I had been sitting on a better job offer for over two weeks and already making plans to move. At the interview, I asked for a higher amount than what I knew the company offered for the position. Needless to say, I didn’t get an offer from them. I took the test and got my dear john letter but for $8.50 I wasn’t upset. To many loops and hurdles for that amount of money. I hadn’t heard of this company either. Interesting. Thanks for sharing, Anna! I completely agree. The tests are way too hard. I’m not sure how math skills apply to reviewing calls or how tests that pilots take have anything to do with sitting around and listening to calls. Oh well it sounded good while it lasted. I, too, was rejected after spending several hours working on the test. It was explained to me if you work less than 20 hours a week you are paid $7.50. If you work 20 hours or more you are paid $8.50. Thanks, TPC! I appreciate the additional info. This one was new to me, Anna. Thanks for passing it along. It sounds like decent gig, provided you can get accepted.